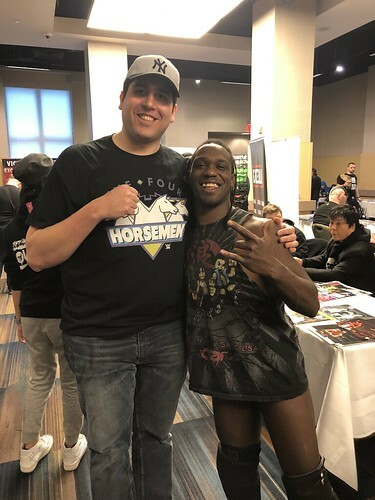 Friday kicked off bright and early with day 1 of WrestleCon. I arrived to the Hilton Midtown just after 8:30 AM and immediately made my way upstairs to the Grand Ballroom. The Grand Ballroom was on the third “level” and, according to the Hilton’s site, holds a capacity of 2,800 people. A line had wrapped around the Grand Ballroom as people were waiting for the doors to the convention to open. I then spotted Ira and we joined the long line of people. AEW’s Alicia Atout and Indie icon Colt Cabana were doing their best to entertain the crowd. 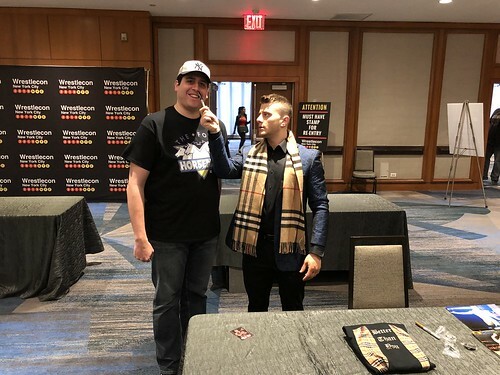 AEW’s MJF eventually interrupted them and did his heel shtick for a while before storming away to one of the tables in the back. I believe Ira scored a selfie with Atout. Ira suggested that we get MJF out of the way and I agreed, so we made our way to his table. 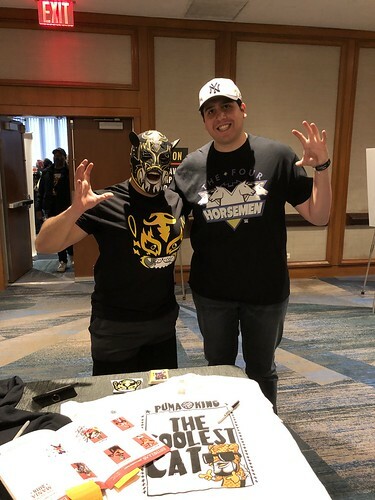 He was still doing the heel shtick (He’d say “Don’t touch me!” when people stood next to him for a photo) and was charging a reasonable $20 for a combo. 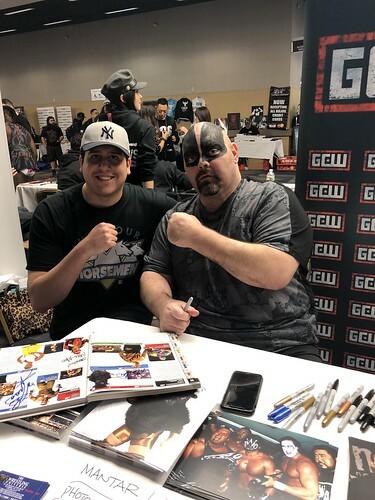 I had him sign my All In trading card and he decided to put his sharpie near my nostril for the photo op (which I thought was funny as hell). First name was in the books! 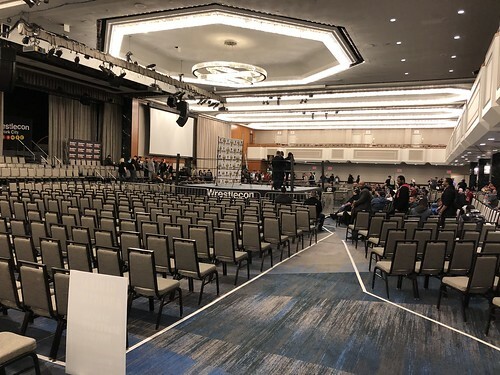 The first wrestling show, US v the World, was scheduled for 10:00 AM though talent was scheduled to sign before and/or after. 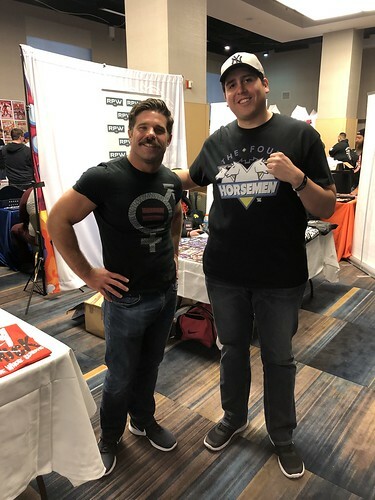 My main want was Brian Pillman Jr. but he was not at his table. I believe I bumped in Lanza and Class around this time as well as Anthony18 later on. I would also bump into my pal Kevin, who is also a pleasure to speak to! It was now just after 9:00 AM and the doors to Americas Halls were now open. Here we go. Everyone spilled out of the Grand Ballroom, turned left, and went through a large corridor that led to the Americas Halls; to the left of the corridor was an escalator that led up to Americas Hall 2 while continuing straight ahead led to 1. I decided to explore Hall 1 first. I immediately spotted Essa Rios and jumped at the chance to knockout a pre-order. Rios was nice enough and signed the Aguila & Essa Rios entries in the Encyclopedia. I didn’t even realize that he was wearing his gear and that makes the photo op that much better. 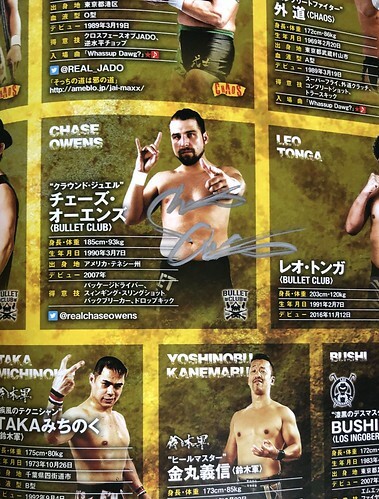 I walked around the gigantic space before stumbling on another pre-order: Chase Owens. 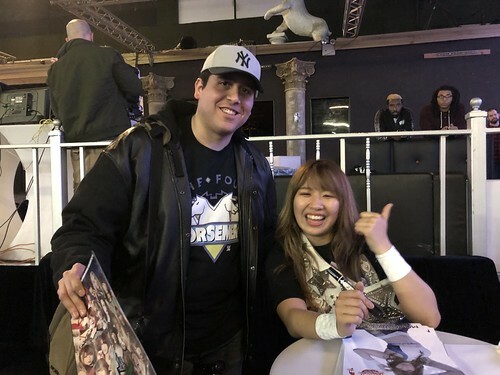 I had him sign my Wrestle Kingdom 12 program. He was really cool. It was getting close to 10:00 AM and I had to head up to Americas Halls 2 for my Four Horsemen pro photo op. The pro photo ops were off to the far-right of the Halls and away from the main floor. Wolfe Studios had set up “lanes” for their pro ops and the first lane was capped, meaning I had to wait on lane 2. The Horsemen arrived just after 10 but Flair got up and left for a bit before coming back about 5-10 minutes later. I waited close to a half-hour before it was my turn but the wait was well worth it as I love how the picture came out. 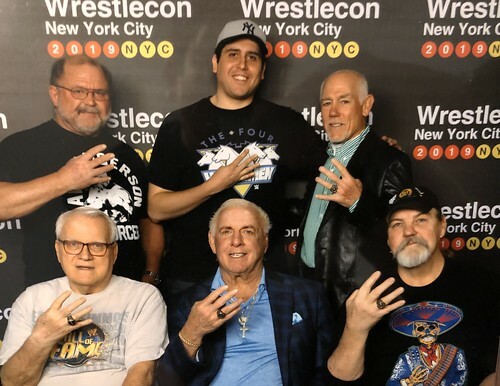 Tully Blanchard looked at my t-shirt and said, “You’re wearing the right shirt!” This particular Four Horsemen photo op is something I’ve always wanted and I’m glad to cross this off my bucket list. My friend Eric had arrived and we decided to explore the rest of Hall 2. We eventually spotted Joey Ryan and we each decided to get a combo. I have to say this: Ryan was not very personable or even friendly. He was polite, sure, but I guess I was expecting him to be more outgoing considering his gimmick. I wouldn’t say he was rude in the slightest, just very subdued and business like. I had him sign my All In trading card and, no, I did not touch his junk. We then made our way downstairs to Hall 1. I spotted the GCW booth and decided to cash-in on three of my biggest wants of the weekend. Up first was Shinjiro Otani. 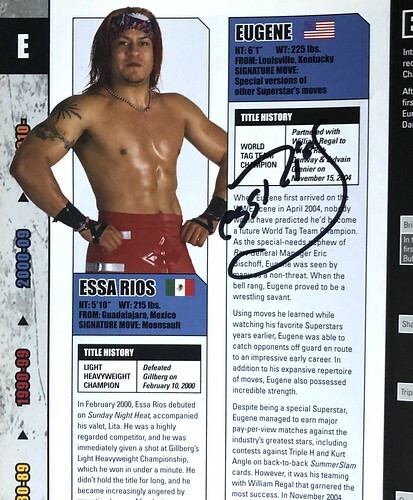 I pre-ordered a combo for him and had him sign my NJPW Wrestling World 2000 Program – something he REALLY seemed to enjoy. He was very nice. Up next was Atsushi Onita, who just had knee surgery a couple of weeks prior to WrestleCon yet still made the trip to New York. Unbelievable. 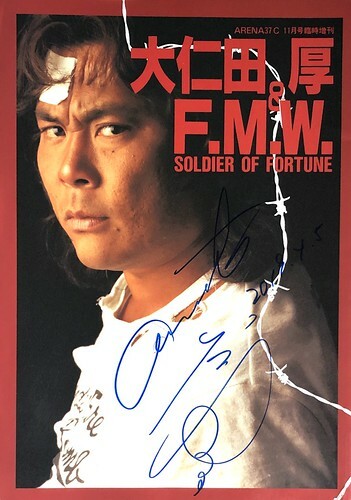 Onita quickly signed the cover to my FMW Soldier of Fortune book and a page in my FMW book that was dedicated to Onita. I sat next to him for the photo and he got me in a headlock. Really cool. Taka Michinoku was next to them. 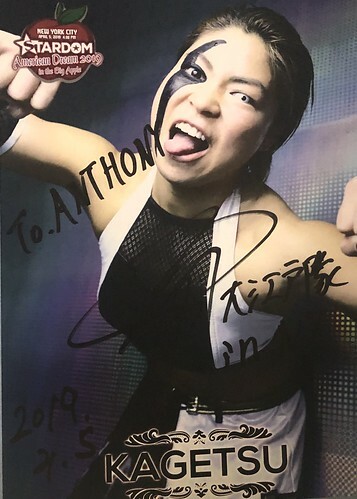 I pre-ordered a combo and had Taka sign the Kaientai and Taka entries in the Encyclopedia. Quite but polite. I was a little surprised that the three of them didn’t seem to have longer lines. Eric and I decided to head over to the Grand Ballroom to checkout the US vs. the World show. While we were there, I spotted Puma King at his table and decided to get a combo. The website listed him as $30 for the combo but I believe he only charged $20! 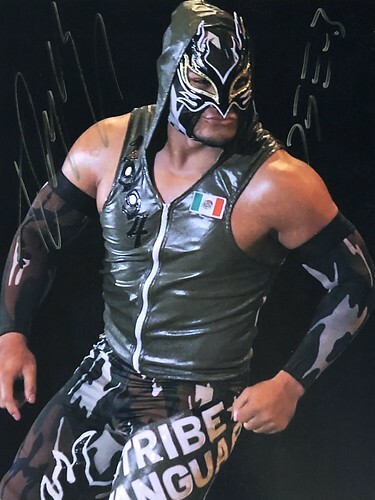 I had him sign my FantasticaMania 2018 program. I sat down and watched some of the show before I realized that I still needed to cash-in on my Great Muta pre-order. I power walked over to Hall 1 and spotted Muta signing at his table with only one or two people in front of me on line. Muta’s pre-sale combo was a pricey $80 but I overheard the Muta’s handler from HOG telling the guy in front of me that prices had increased day of, so I was glad I ended up saving some dough. 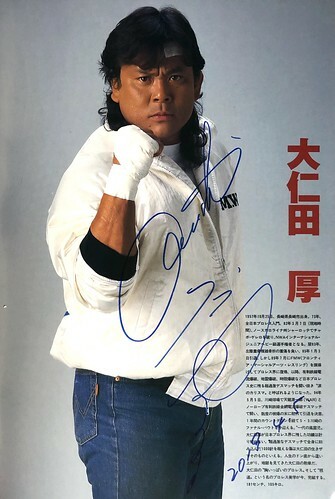 Muta was fine and signed my Wrestle World 2000 Program (that was just signed by Otani). I then stumbled to John Moses photo op area and had my e-ticket for the Minoru Suzuki op scanned and exchanged for a physical ticket (more on that later). I made my way back to the ballroom and this is where the first minor bump in the road happened. 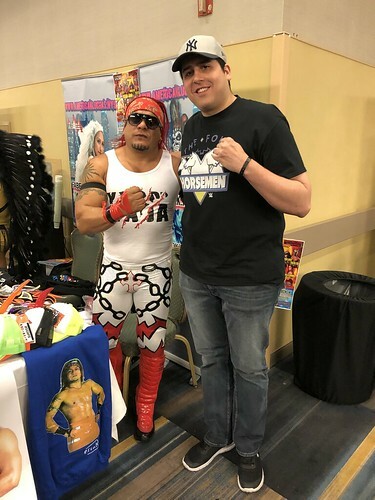 I spotted Flamita behind a table and I had pre-ordered a combo for him via Highspots. I approached Flamita and showed him my receipt on my phone but he didn’t understand what I was saying. I was told by Steve to go up to the info booth and explained the situation. 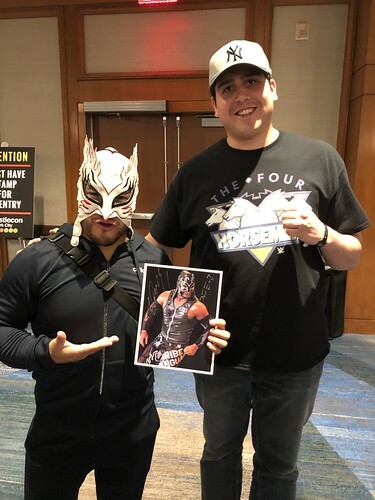 They realized that Flamita was actually supposed to be at Americas Halls 1, not the Grand Ballroom, and one of the employees told me to hang tight as he ran to Flamita’s table to retrieve his 8x10s and bring them to his new booth at the Grand Ballroom. It was around this time where I met reader Michael from LA! He offered up some really nice compliments about the blog and it was a pleasure to met him! The employee came back about 10 minutes later and told Flamita that it was okay to sign a photo and take a picture with me. I was super impressed and appreciative of how the staff handled that. Awesome. 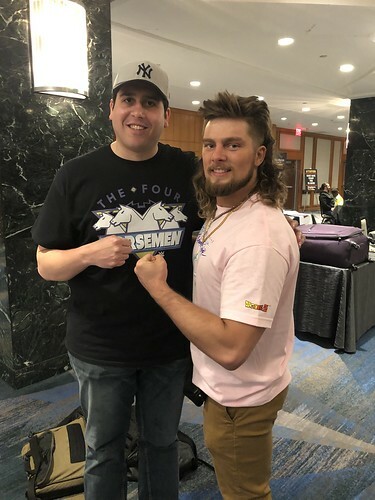 I then spotted Brian Pillman Jr. at his table and jumped at the chance for a combo, which I believe was only $10 or $20. 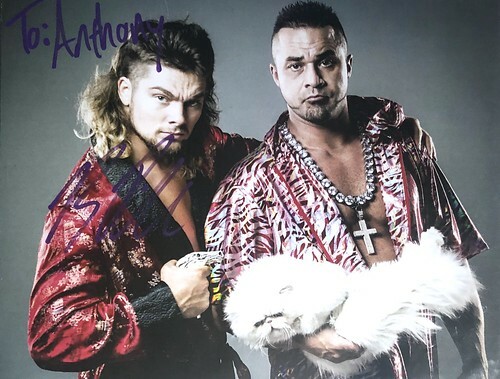 He signed an 8x10 that featured him and Teddy Hart. He was incredibly, incredibly nice and really took time with everyone. Eric and I decided to head back up to the Halls. 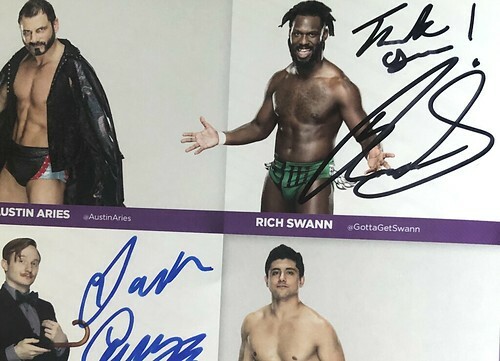 I ended up getting a combo with Rich Swann, who was only $10 for the combo (the schedule had him listed for $20). I then spotted The Wrestling Universe’s table where Mantaur was stationed. 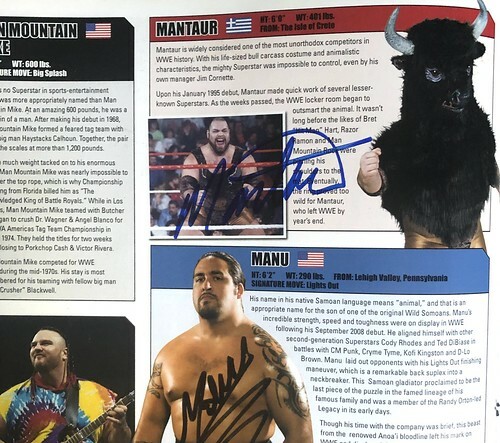 Mantaur was nice and signed his entry in the Encyclopedia (I’m kicking myself because I just realized that I missed him in the Truth Commission entry). He was a $30 combo. 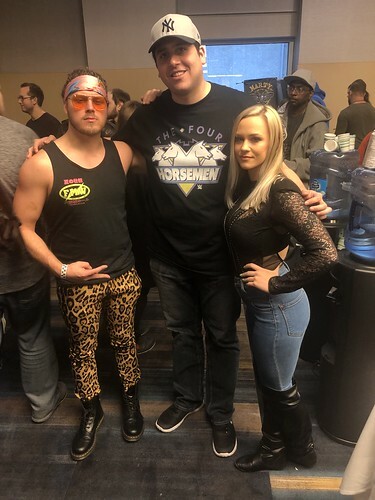 Next were AEW’s Joey Janela and Penelope Ford. 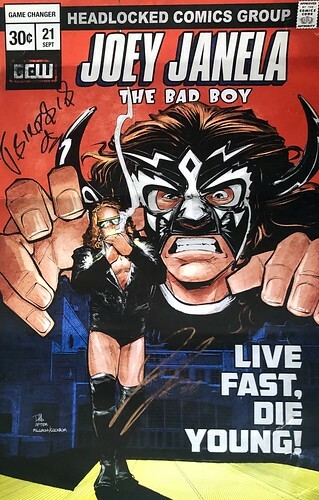 I believe it was $40 for a dual combo that ended up including two autographs (Ford signed an 8x10 while Janela signed a poster that was previously signed by Psicosis). I also got them on my AEW trading card. I realized that the lighting in the picture was poor, so I asked for a redo and they graciously obliged. So here’s the one annoyance that I ran into: we made our way down to the Rhinelander just before 1:30ish and discovered a very, very long line to purchase tickets to meet the New Japan crew. A (presumably) New Japan employee was laying out stacks of 8x10s and told people that Minoru Suzuki, Hiroshi Tanahashi, Tomohiro Ishii, and Rysuke Taguchi would be $30 combos while the tag team Sho & Yoh would be $40. He then stated that they were only selling combos. 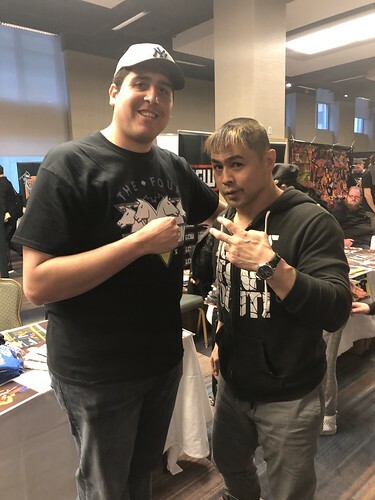 This pissed me off because WrestleCon really pushed people to purchase pro photo ops because Suzuki wouldn’t be signing at his table for long. My plan was to buy the pro photo op then get an autograph but now I was forced to buy the combo if I wanted the ‘graph? I talked with the employee and his attitude was basically “sorry not sorry.” Whatever. 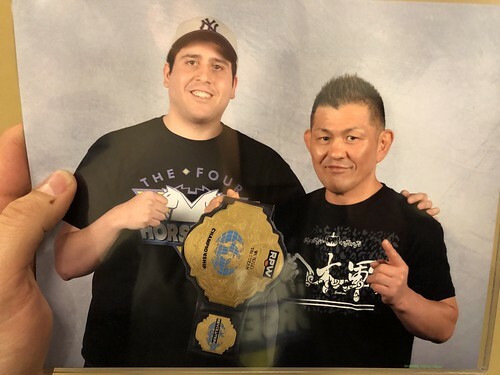 I had my pro photo op with Minoru Suzuki and that’s when I realized that I had lost my ticket to meet him. Crap. Thankfully, John Moses were super cool about it and just wrote me another one. Suzuki came up soon after 2:15 and was posing with his RevPro belt. Super cool to meet him. We made our way back upstairs as Eric wanted an autograph from Lita. 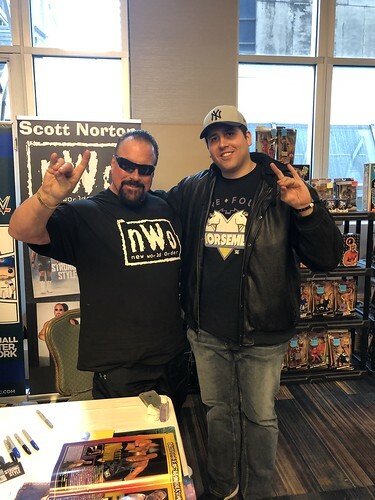 I spotted Scott Norton at his table and decided to get a combo with him. 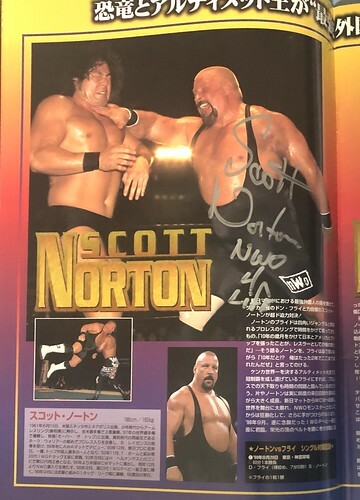 Norton signed my Wrestle World 2000 program (just signed by Otani and Muta!) and posed for two photos: one doing the Too Sweet and a regular pose. Awesome. Eric and I took the E train to Jamaica and made the very short walk to the NYC arena and arrived just before 4:00 PM -- and we were blown away at the line of people waiting to get in. The line wrapped around the entire building and then some. It was raining but, thankfully, they were letting people in quickly. We found a pair of GA seats right near stage and decided to wait for the massive merch line to die down before we hopped on it to purchase M&G tickets. I hopped on the line during the first match and purchased two M&G tickets. The show itself was fantastic (way better than Evolve). The area became a freaking madhouse right after the show ended, though, and it was a gigantic clusterf**k as people tried (and miserably failed) to form lines. I decided to meet Momo Watanabe who was incredibly nice. Funny story: she asked everyone to spell their names and she confused the “n” for an “m” in my name when she signed her 8x10. No biggie. She also signed the program I picked up. I then joined the cluster of bodies that were trying to get to Kagetsu. I waited for about 20 minutes as people pushed and cut the line before I finally fought my way up to her. 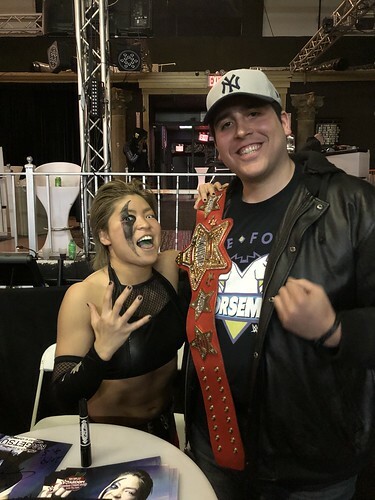 She was laos incredibly nice and placed the World of Stardom Championship on everyone for the photo op. 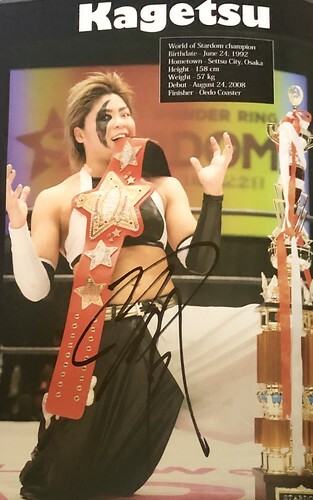 She signed her 8x10 and my Stardom program. I spotted ROH’s Cheeseburger in the back but didn’t have an opportunity to ask for a photo op as he was on the phone and disappeared. Oh well. I was dead tired so I made the long trek home to NJ. Stay tuned for Part III of my Mania Weekend! 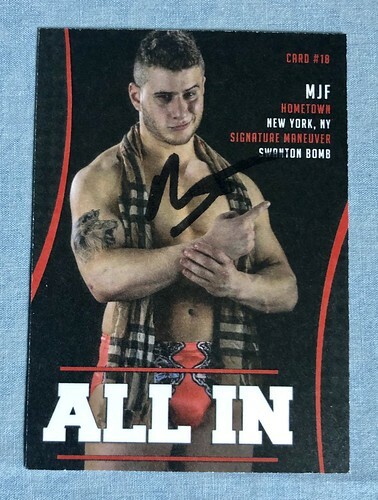 AEW have trading cards? HAEH? They haven't even had one show yet how can they have cards? Very cool report. The pro op with the Four Horsemen came out great. I could have gotten into that NJPW meet and greet line early but I'm barely familiar with any of the wrestler they had (I've seen a couple of the names before) so I skipped them. 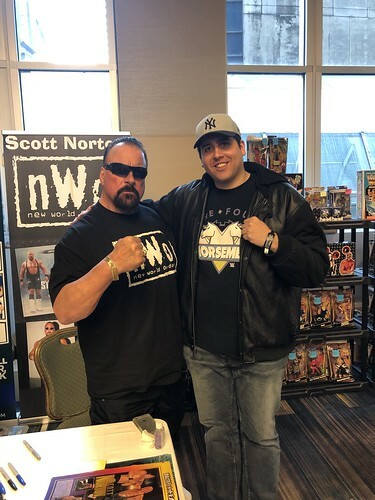 Nice Scott Norton autograph too! How? They printed them. Indy promoters do it all the time. It’s cheap. Right. But indy promoters have an actual product to showcase on cards. So jealous of the ohtani pic. So weird about Arn. He has never smiled for photo ops before and this weekend, he was smiling for everyone. Guess leaving wwe improved him. And jj’s mouth is open for everyone’s pic haha. They have wrestlers under contract. That’s their product. Your reports are usually the only ones I bother reading. Great job. Is there a particular reason why you always get your cards signed on the back? One member on this site, I don't remember who but may have been Jeremiah or Steve, got a photo with Arn and Arn had a big smile which is rare. I wonder if JJ's mouth was open all the time because he is so personable and always chatting. 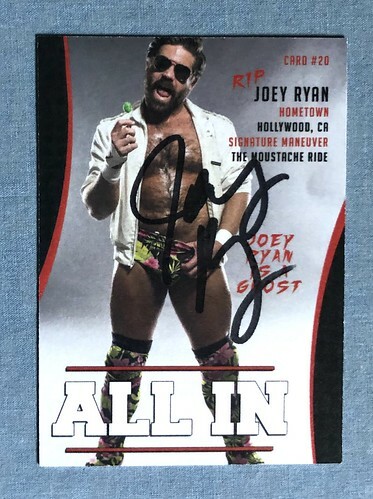 These trading cards are pre-AEW. These were made to commemorate the first All In show. Ohtani was super fun to meet. Arn seemed to be in a great mood! Wow, thanks! 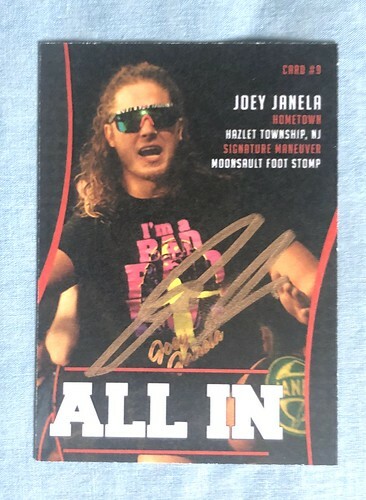 The material on the front of the cards are sort of glossier than the material on the back and autographs tend to rub off the front (it happened with my Cody PWG card).